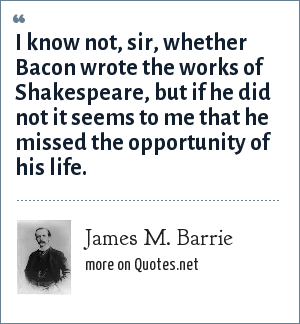 James M. Barrie: I know not, sir, whether Bacon wrote the works of Shakespeare, but if he did not it seems to me that he missed the opportunity of his life. I know not, sir, whether Bacon wrote the works of Shakespeare, but if he did not it seems to me that he missed the opportunity of his life. "James M. Barrie Quotes." Quotes.net. STANDS4 LLC, 2019. Web. 23 Apr. 2019. <https://www.quotes.net/quote/19683>.